About 24 hours later than usual... went to Buffalo, NY yesterday, visited Orchard Park Antique Market as well as the Savers down the road. The antique market, it wasn't very good. I was very excited to go there, the market boasts 100's of booths, the only other market being just over an hour away & being in the United States, they'd have a great selection - wrong! (because when I visited a market in Michigan, it was pretty decent). Majority of the booths are about the size of a Ikea Billy bookcase, everything locked up & there are a larger number of niche booths than I am used to (coins, sports mem, Star Wars, action figures). Extremely low on kitchen wares, too. About 10 pieces of Pyrex in the whole shop. I was ready to blow $150 there, hah. I spent $30. The Savers there was pretty decent for a Saturday evening, very crowed, but a decent selection & the selves weren't bare. The fellow shoppers there were extremely polite, quite an extreme change from the shoppers here in Toronto! I feel like absolute crap. Maybe it's the lack of sleep, but I also vomited yesterday, have a migraine & ate like 100 red vines. 4 pounds of Red Vines for $7 in the USA? We pay like $3 for a 400g bag of Twizzlers, lol. But yeah, we got up Saturday morning at 7:30 to head to Buffalo, got back at 12:00am, had to get up at 6:45a for work.. plus the time change.. plus the headache. Blogging had to wait. Here's what I got from the market! A pair of RCA Nipper Salt & Pepper Shakers. These have been on my want list. Marked down from $23 to $9.95. I have been on an extreme vintage card hoard/hunt. These vintage birthday card were just too fabulous to pass up! $5 for the set. I love how the firecracker has a little piece of yarn hanging out from the card - very cute! $3 for these vintage nail swizzle sticks. I got a couple other things from the market, but I am saving them for Rednesday! I also picked up some vintage cards from a flea market, but dunno where they are, so here are some I picked up at the thrifts this week... & some pins... & some stickers (the Mello Smellos from Savers in Buffalo). Also from Savers for $2.99 is my first loaf pan, a Spring Blossom Green. I haven't found a Spring Blossom Green in what seems like forever.. well.. one I'd buy! I bought these salt & pepper shakers, hah, blah. 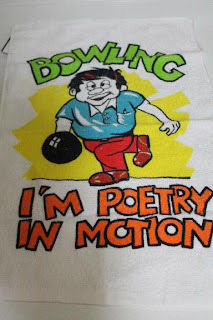 I really love the first blowing linen. 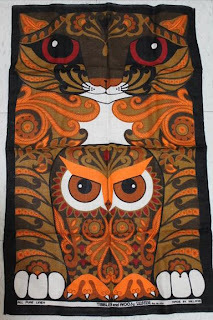 I've only found with similar fabric (kinda like a hand towel), but found lots of tea towelish fabric ones.. countless. I think I have 3 of the other one in this post. Another Ulster tea towel! This ones called Tibbles & Woo! Just sold on eBay for $25.49 in FEB. If you ever find any of the cute first ones - send 'em my way! Surprise, I collect 'em! How fun a thrifting trip, even if the place wasn't as good as you expected. That last tea towel? Lovely! Thank you for hosting. Great things! Love the RCA shakers! So funny about the Red Vines (not that you're sick), but YES, doesn't that big bag of them rock???? This one is a gigantic, 4lb tub. I got in trouble when I put it in the cart, but surprisingly, my BF didn`t care that I was going to buy it. He gets more pissy about a tea towel, LOL. I have to drive 40 minutes to get to my favorite thrift store. Where I always find items that I just have to have. But the thrift stores within 5-15 minutes of me... are a joke. And the three Goodwill's, that are in my daily pathway of travel. Are big fat jokes. That`s a bummmer, but at least you have a secret spot that always pays off. I`m trying about some new stores, we`ll see what the pay off is like..
You did good!! When you go someplace new, you are always filled with anticipation and hope for great finds, glad to see it worked out!! The loaf pan is pretty cute!! They're hard to find! The towel and stickers are amazing! Beautiful scores, as always. I love the colorful cartoony fun. You always find the best salt and pepper shakers. 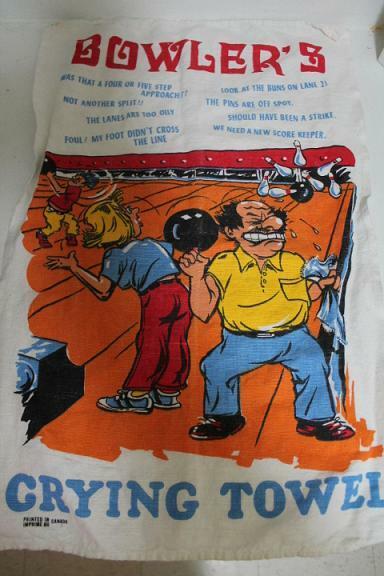 And those bowling towels are freakin cool! Hope you are feeling better! You gotta pace yourself on the red vines! Seriously, they kill my stomach, but I still love them. The owl towel is really cool. I'll be back later tonight to link up if I ever get my post finished! I binge when I buy them, since we don`t have them here in Canada. I feel like a little piggy. ohmigosh - that last tea towel! gorgeous! Hope so! There is a lot of decent thrifting, I guess.. but seems there is a lot of competition, too. Have fun when you come! Love your finds - especially the salt and pepper dogs - so cute! Greetings from Scotland. So happy that you found the RCA dogs salt & pepper shakers. Meant to be, I tell you! I am pretty sure that you got sick from the Red Vines. They always make me feel like total crap when I eat them too. It was the Red Vines. There is only 2 pounds left.